Im loving loving loving my hair journey. I pray that the lord continues to bless my hair and keep it away from harms way (like the lady that made my hair fall out a yr ago---eeek). Im very content with my results and hair techniques that I use for my hair. I am still 9 months post relaxer and 9 months completely HEAT FREE (I believe this has helped my hair tremendously- that, hairfinity, and my hair care regimen). Only 1 week and 3 days after my big chop I decided to do my first official length check!! All I can say is, "WHOOO!!! 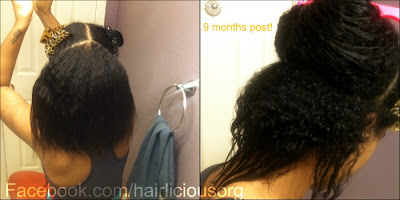 The power of shrinkage baby" Oh my! Note: click on the picture to view actual size and written details! I have read many blogs and even saw a lot of YouTube videos where some women regret their chop or complain of their short hair after doing the big chop. I honestly think that everyone should go at their own pace, do things that they know they will feel comfortable with. Before doing my Big chop I researched a lot--- I looked at TWA's in all different stages- Some really really short, others in between and others just a few inches from no longer being a TWA! I always knew which stage I wanted to be in and once I saw that I had enough hair to do a puff I felt like it was time. 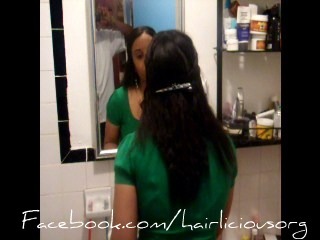 Co-washing my transitioning hair- My final step not included in the video! I forgot to mention in the video my final step after having co-washed my hair. I ALWAYS apply my Cantu Shea butter leave in conditioner after every wash! This is the final step. After having rinsed out my DC I apply my leave in on my damp hair and tie my scarf on my head to air dry (scarf method). Something about yesterday's wash day kept bothering me. I could not pin point it at the time but I just kept staring at my hair, almost analyzing every strand. 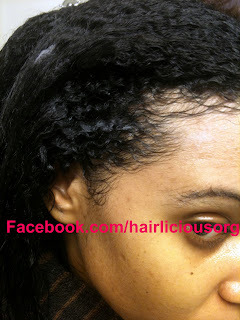 I then took pics of my hair before and after my wash. Looking at my hair before my co-wash made me feel good and accomplished because a year ago my hair was super thin (like never before)---- So I was happy :) But when I took shots of my wet hair, I became anxious once again. I kept asking myself, "why dont you just go ahead and BC?". I gave it some thought and even stared at my scissors just contemplating on whether or not it was time. Last time I blogged and had texture shots ( at 8 months post) I said I will "texture shot" blog at 10 months post, but I have since changed my mind. I would like to see my progress on a month to month basis. Its motivating and exciting and I promise you that I cant wait to look back at my blog and say. "wow-". Almost a year later!!!! My hair has come a long way!!! Last year, late November- my hair fell out! Allow me to repeat this story once again! My hair has ALWAYS been in my mother's care. I have never in my life allowed anyone to style my hair, relax my hair or even play in my hair except for my mother who has been a certified beautician even before I was born.